The median rent in the San Francisco, Oakland and Hayward area is $3,300 per month. That’s $198,000 in rent payments, over a 5-year period. That’s more than the median home value in 26 other states. The median home price in America today is only $225,300. In Oakland, you can easily rent a 2-bedroom apartment for $2,500 per month. That’s $150,000 in rent payments over a 5-year period. As a result of these rising home prices, many Bay Area families must decide, continue to rent or move to areas where they can afford to buy. The median household income in Alameda County is $85,743. That’s $7,145.25 per month. According to the California Housing Partnership Corporation (CHPC), Alameda County residents need to earn at least $7,547 a month, just to afford the average asking rent. That same monthly payment can buy a 5-bedroom, 3 bath, 2,500 sq. ft home in San Joaquin County. The most common objection is the commute. Many people don’t want to drive 90 minutes to work every day. However, more families are beginning see the value in driving 90 minutes everyday to a home they own. The truth is, the extra 2 hours a day they will spend commuting, may prove to be the most profitable 2 hours of their day. The increase in home equity and principal reduction over time, may out turn out to be their best investments. The illustration below, show’s a side by side comparison of what will happen in the next 5 years for the family who continues to rent vs the family that buys a home. 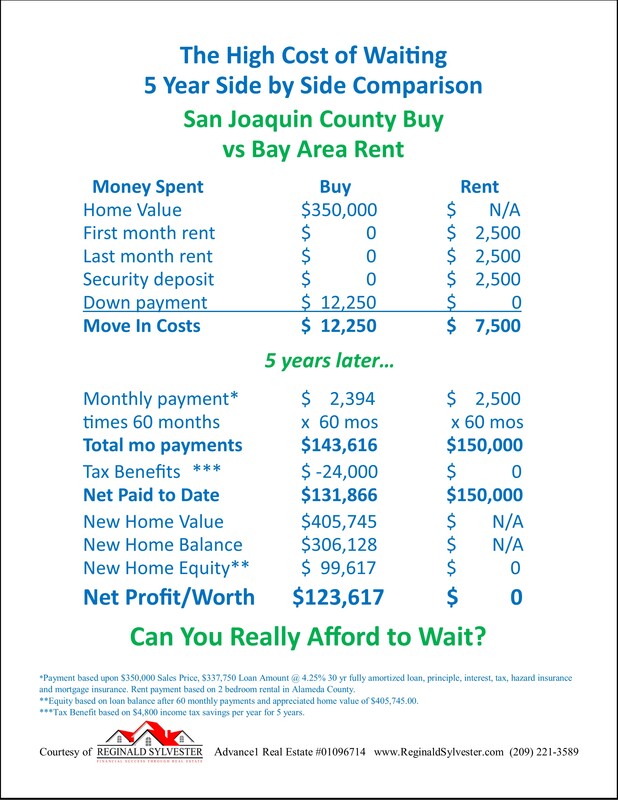 The above illustration shows that buying a home in San Joaquin County is a far better investment after 5 years. There are 8 cities with affordable homes for sale in San Joaquín County. They are Mountain House, Tracy, Manteca, Lathrop, Weston Ranch, Stockton, Ripon and Lodi. As far as commuting, it’s no longer an option for many who wish to buy. It’s a necessity. Many people can remember a time when places like Pleasanton, Livermore, Hayward, Fremont, Walnut Creek, Concord, San Ramon and Danville. All were considered ‘way out’ and ‘too far to drive’. Today, they’re all considered prime real estate. San Joaquin County now seems to be prime real estate for today and tomorrow. You must ensure a successful outcome, through insurance. If you buy a house, it must be insured. If you buy a car, it must be insured. If you drive a car, you must be insured. If a professional sports team signs a professional athlete, they insure their investment (his life). So, why are so many families not adequately insured? It’s the biggest mistake in financial planning for most families. Any home financed by a bank must have mortgage insurance if, the amount owed on that home is greater than 80% of the value of the home. This mortgage insurance is paid for by the homeowner, but it protects the interest of the bank only, not the family. The average mortgage insurance premium today on a new FHA loan is around .0085% of the sales price. On a $250,000 home loan, that’s about $177.00 per month. This homeowner will also be required to pay fire and hazard Insurance of about $58 per month. Hazard insurance is also required by the bank to protect their interest. More people lose their homes due to death and disability than any other reason, because the homeowner is not properly insured. Most families have failed to take action and secure a term life insurance policy or ‘mortgage protection’. This homeowner will be spending $235* per month or $2,820 a year, on insurance to protect the interest of the bank. Unless, they take action and buy a life insurance policy to protect their biggest investment (their home and family), they are at great risk. Life insurance is the foundation of a good financial plan. ‘Death is not a matter of if, it’s only a matter of when.’ Be prepared. When we plan for our families future it includes our home, a place for us to live and enjoy life. We want our children to go on to college and have successful careers. We want to retire and relax comfortably in our senior years. It’s free to apply for a fully underwritten policy, most people don’t even know how affordable coverage really is. Take action today. Buy a House for $100,000. Sell it for $50,000 and still make a profit! It's called, Wisdom & Wealth, I will give you the answer to this question and so many more! Once you clearly understand this answer and the principle behind it, you're on your way to a whole new understanding! Sign up now... you'll be glad you did.